Stedelijk Museum Bureau Amsterdam, April 18–May 31, 2015. 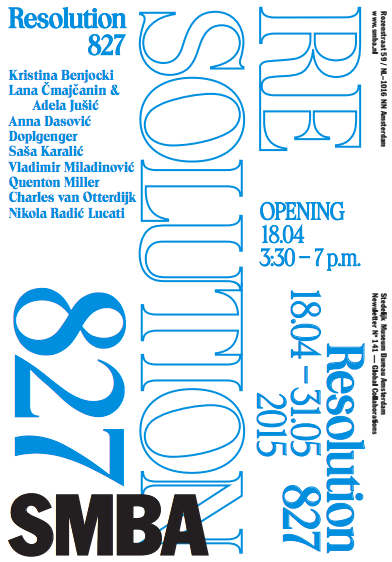 “Resolution 827” is the outcome of a collaboration between Stedelijk Museum Bureau Amsterdam and the Museum of Contemporary Art, Belgrade. The title of the exhibition, “Resolution 827”, refers to the UN resolution that was adopted in 1993 establishing the International Criminal Tribunal for the former Yugoslavia (ICTY). The artists involved in this exhibition scrutinise questions of responsibility in each of the societies in question, but their contributions also revolve around the way in which we can relate to the atrocities through the procession of the visual and audio files collected from ICTY and other archives. Curated by Jelle Bouwhuis, Zoran Erić and Joram Kraaijeveld. With contributions by: Kristina Benjocki, Lana Cmajcanin and Adela Jušić, Anna Dasović, Doplgenger, Saša Karalić, Vladimir Miladinović, Quenton Miller, Charles van Otterdijk, Nikola Radić Lucati.